In previous posts I showed how we can create custom Matlab app toolstrips using various controls (buttons, checkboxes, drop-downs, lists etc.). 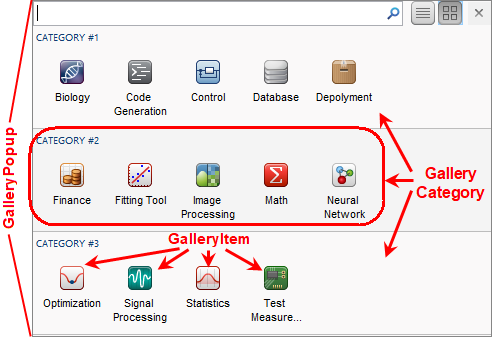 Today I will show how we can incorporate gallery panels into our Matlab toolstrip. Toolstrips can be a bit complex to develop so I’m proceeding slowly, with each post in the miniseries building on the previous posts. I encourage you to review the earlier posts in the Toolstrip miniseries before reading this post. 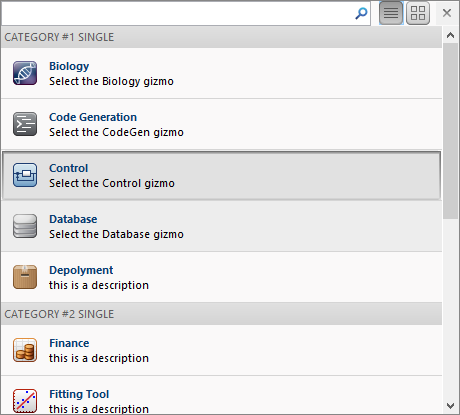 Toolstrip galleries are panels of buttons (typically large icons with an attached text label), which are grouped in “categories”. The gallery content can be presented either in-line within the toolstrip (a Gallery control), or as a drop-down button’s popup panel (a DropDownGalleryButton control). In either case, the displayed popup panel is a GalleryPopup object, that is composed of one or more GalleryCategory, each of which has one or more GalleryItem (push-button) and/or ToggleGalleryItem (toggle-button). For a demonstration of toolstrip Galleries, see the code files in %matlabroot%/toolbox/matlab/toolstrip/+matlab/+ui/+internal/+desktop/, specifically showcaseToolGroup.m and showcaseBuildTab_Gallery.m. Note that in a real-world situation, we’d assign a Description, Tag and ItemPushedFcn to all gallery items. This was elided from the code snippet above for readability, but should be part of any actual GUI. The Description only appears as tooltip popup in icon-view (shown above), but appears as a visible label in list-view (see below). Alternatively, if we use GalleryItem instead of ToggleGalleryItem, the gallery items would be push-buttons rather than toggle-buttons. This enables us to present a gallery of single-action state-less push-buttons, rather than state-full toggle-buttons. The ability to customize the gallery items as either state-less push-buttons or single/multiple toggle-buttons supports a wide range of application use-cases. ShowSelection – whether or not to display the last-selected item (logical; default=false). Needs to be true for Gallery and false for DropDownGalleryButton. Switching from icon-view to list-view and back can also be done by clicking the corresponding icon near the popup’s top-right corner (next to the interactive search-box). Now that we have prepared GalleryPopup, let’s integrate it in our toolstrip. Clicking any of the drop-down (arrow) widgets will display the associated GalleryPopup. Popup – a GalleryPopup object handle, which is displayed when the user clicks the drop-down (arrow) widget. Only settable in the constructor, not after object creation. MinColumnCount – minimum number of item columns to display (integer; default=1). In Gallery, this property is only settable in the constructor, not after object creation; if not enough width is available to display these columns, the control collapses into a drop-down. In DropDownGalleryButton, this property can be set even after object creation (despite incorrect internal documentation), and controls the width of the popup panel. MaxColumnCount – maximal number of items columns to display (integer; default=10). In Gallery, this property is only settable in the constructor, not after object creation. In DropDownGalleryButton, this property can be set even after object creation but in any case seems to have no visible effect. Description – tooltip text displayed when the mouse hovers over the Gallery area (outside the area of the internal gallery items, which have their own individual Descriptions), or over the DropDownGalleryButton control. TextOverlay – a semi-transparent text label overlaid on top of the gallery panel (string, default=”). Only available in Gallery, not DropDownGalleryButton. The next post will discuss popup forms. These are similar in concept to galleries, in the sense that when we click the drop-down widget a custom popup panel is displayed. In the case of a popup form, this is a fully-customizable Matlab GUI figure. Following that, I plan to discuss toolstrip collapsibility, the Toolpack framework, docking layout, DataBrowser panel, QAB (Quick Access Bar), underlying Java controls, and adding toolstrips to figures – not necessarily in this order. Matlab toolstrips can be a bit complex, so I plan to proceed in small steps, each post building on top of its predecessors. If you would like me to assist you in building a custom toolstrip or GUI for your Matlab program, please let me know. I have one question w.r.t. to performance: assuming a gui app, not based on GUIDE, which is fairly optimized (I am following your advice/books for years), is there a significant overhead converting/using a toolstrip? @Gep – yes, apps and toolstrip take a few seconds to render before being ready. This is noticeably slower than corresponding legacy (Java-based figure) GUIs. Hopefully the performance will improve in future Matlab releases. That being said, apps and toolstrips provide a radically different way for UI interactivity than the legacy GUI, and the performance impact might well be offset by the sleek-looking appearance. This tradeoff is not much different from that of AppDesigner-vs.-GUIDE — AppDesigner-created uifigures display much more polished UIs than GUIDE, yet are significantly slower to render. The big benefit here is that you have a choice. You can decide for yourself, based on your specific needs and aesthetic preferences, whether to base your GUI on (1) pure legacy figures, or (2) a combination of apps/toolstrips/figures, or (3) pure AppDesigner/uifigures. I am a strong advocate of not hiding the full set of available tools from users, and letting users decide for themselves what’s best for them. Except the initial performance hit you mentioned when rendering the figure with toolstrip for the first time, is there also a UI response degradation while using/updating the figure axes/contents assuming option 1 (pure legacy figures) ? I think the only major performance hit is in the initial rendering. I did not notice any sluggishness when updating the internal figures, but I never ran a thorough benchmark. Can’t thank you enough for your quick response. Reza (14 days 4 hours ago): I have the same problem. this Java widget got error in compiling via Matlab 2018! Could you please show me how to solve this?